Hi! I am a Sweet & Sassy stuffed pony, and I cannot wait to meet you and become your life-long friend. I have a wonderfully huggable body and my soft fur is snowy white. Not only are my pretty purple hooves glittery, but my nose is glittery, too! You can see the sparkles surrounding my cute little purple embroidered nostrils and happy smile. I love to let the wind blow through my fluffy purple mane and tail. And wind or not, I keep my eyes wide open and enjoy the view of everything around me with my beautiful glittery blue eyes. And check this out... 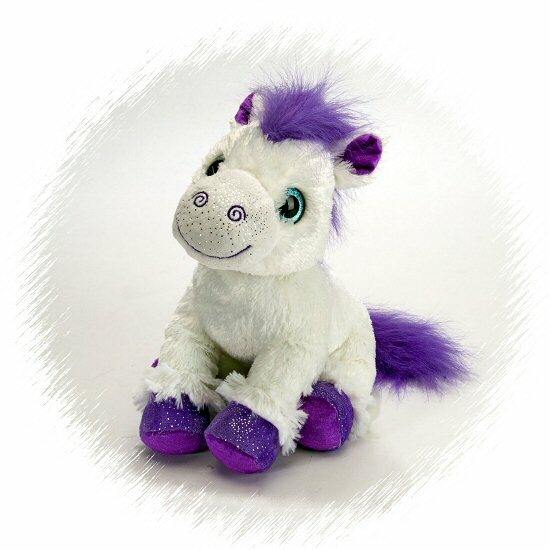 When you purchase me (aka Sweet & Sassy plush pony), a portion of the proceeds helps to provide housing and education for disadvantaged children, as well as protection for abandoned animals throughout the world. It's definitely a win - win - win situation! Fun Facts about Horses: Did you know that some horses are trained as therapy horses which become an essential part of treating both physical and emotional issues, especially in children? Horses are amazing creatures!